Grab the Current Digital Issue for Free! Update: As of December 23, 2013 Tim and Donna moved their crowd-funding efforts for this endeavor to Indiegogo. Please follow this link for information. Fundraising will continue until February 2, 2014, and there is a chance to get some really nice investor perks for as little as $10.00. If you ventured out on Black Friday for a deal, shopped on “mom and pop” centric Small Business Saturday, or just can’t wait until Cyber-Monday, here’s my spin – with tongue planted firmly in cheek – for a perfect Black Sunday shopping experience. Tim and Donna Lucas, the dynamic duo of publishing in the horror, science fiction and fantasy genres, have begun offering the content of their exceptional digest sized print magazine Video Watchdog in digital download format as well. While an issue is “current” (usually for 2 months) the price is FREE!. Afterward a digital back issue will be priced @ $3.99 for a download. Yes, a “crazy business model” as Donna has noted, but one that potentially gets VW into the hands of many more interested parties. Currently available for reading on Apple mobile products, like iPad, Donna assures Android compatibility is coming shortly. You can also access it on your computer as I did, and reap the full rewards of the new format. Grab issue 175 NOW while it’s $0 dinero. It’s yours forever and will work on multiple platforms as they are introduced at no added cost. The digital issues are loaded with media extras like trailers for the films discussed, audio notes from the editor, and even “live” adverts that can be as much fun as the editorial content. Buried in my basment, neatly boxed and numbered, is every issue of Video Watchdog. It’s an amazing wealth of information published over the last 25 years, but essentially dead, or at least dormant, without an indexing system. Trust me. The good news is that in addition to forthcoming issues, Tim and Donna have launched a Video Watchdog Kickstarter Project in order to fund the digitizing of their entire back catalog. Yes, every issue of VW created in the last 25 years, even those long out of print, will again be available. Most importantly they will be searchable, yielding an incredible amount of film scholarship at your fingertips. There are a number of different packages available based on your contribution and you should hop over there to get a look. 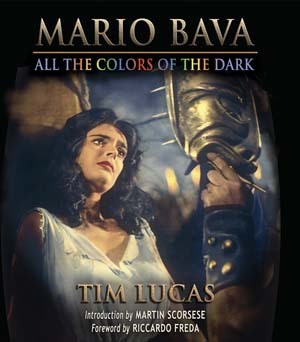 If that wasn’t enough, Tim’s titanic tome All the Colors of the Dark, a biography of Mario Bava, the director of the classic Black Sunday, is now also available in digital form. The original printed book sells for as much as $250.00 and requires a wheel barrow to move from room to room. It’s a labor of love and filled with the kind of obsessive detail genre fanatics like myself crave. Now Tim and Donna are offering an unexpurgated, in fact expanded with media, digital version for a meager $29.99. A digital “stocking stuffer” for the horror fan in your house if I ever saw one. If you truly miss the heft of the original Bava Book, which is beautiful in it’s own right and still eminently collectible, I suggest a few fishing weights attached to your iPad could help simulate the experience. Otherwise the digital version is the preferred medium for subway, bus and plane trips. All current Video Watchdog digital content, including a sample of the Bava book, can be found here. The download requires a one time Video Watchdog account creation, then you are ready to rock. Enjoy!